When it's time to ride off into the sunset, an American cowboy hoists himself into the saddle and gallops away. A Frenchman stops to ensure he has the proper certification for the endeavor: Is he Level Galop 3 or above? Because in horseback riding, as in skiing, bread-baking, tennis, gymnastics, swimming, hair-dressing, and just about any other activity you can think of, the French are -- not surprisingly -- bureaucratic about classifying, naming, and certifying their accomplishments. What makes it a different level of bureaucracy than what I'm used to in the US is that the French are very official about everything -- the skills needed for each level, the ages allowed for each test (there's not much room in the system for being a prodigy), the materials and equipment allowed. Every sport and activity seems to have a national organization overseeing it. For example, the ENF, l'Ecole Française de Natation, the French School of Swimming. Yes, there are certainly certificates and diplomas all around the world for many activities. But the French take taking it to another level to another level (no, that's not a typo; it's exactly what I meant to say). To learn anything in France, you need to be prepared for a stage (like camps), a formation (official class work), and a certificate. In the case of horseback riding, the levels are called Galop 1, Galop 2, etc. up to Galop 7, awarded by the FFE, the Fédération Française d'Equitation. Galops 8 and 9 were lost to the FFE reform of 2012. There is always some recent reform to take into consideration, adding levels of bureaucracy to the bureaucracy of levels. The girls' gymnastics categories recently switched, from Federal B to National A or some such thing. Honestly, I don't even know any more. But whatever level or category they're competing in, they've got the appropriate certificates from the FFGym (Fédération Française de Gymnastique) as proof. And if not a certificate, then how about a pin? 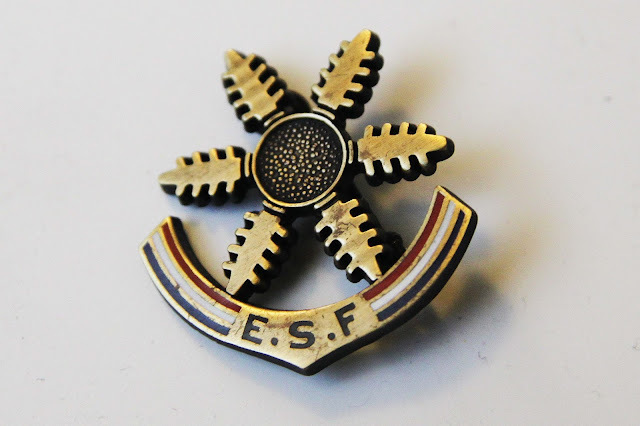 Without even looking it up, I assume that ESF stands for "Ecole de Ski Français". I am almost correct: it is "Ecole du Ski Français". The French like their national associations, federations, and schools. There are too many tests and levels in too many ski-resort disciplines to list them all, but for a small taste: you could be Gold, Red, Silver, Bronze (it's inexplicable, the "Vermeil" or "Red" on that list); you could be an Arrow, Chamois, Rocket, or Skier X. Pictured above is Gigi's Etoile d'Or (Gold Star) pin for skiing. She's a lower lever in snowboarding. The littlest skiers and snowboarders are Nounours or Flocons (Teddy Bears and Snowflakes) and work on their plain "étoiles" (stars) -- 1, 2, and 3 -- before they work on their metallic stars. Every resort around the country uses the same system which, I must admit, does make it a little easier to go to a new place and get your child (or yourself) into the appropriate class, right away. Recently, I receive an email that one of the girls' coaches has been "licencié" -- "licensed". I figure there has been some new level passed and certificate earned (master coach, master-teacher coach, floor tumbling specialist, whatever) and am just about to write to the coach in question with a big "congratulations!" Luckily, I finish reading the letter in its entirety first, and given what I assume "licencié" means, none of the rest of it makes sense. So I look up the verb "licencier" and discover that though a "licence" is, indeed, a license, to "licencier" somebody means to fire them. So the coach is not promoted or newly certified, but rather quite the opposite. La Fourmette de la Croix de Chazelles is a raw cows' milk blue cheese from Auvergne, from the GAEC des Croix de Chazelles, founded and operated by the Vergnol brothers. A GAEC, or Groupement Agricole d'Exploitation en Commun, (A Group for Agricultural Use in Common) is an administrative organization (the idea was first introduced in 1962) that allows up to ten individuals to band together and form the equivalent of a family business, with all its business benefits, even if they're not actually family. In this case they actually are -- two brothers who, around 15 years ago, took over the family farm started by their grandfathers in the early 1800s. The Puy de Sancy (Hill of Sancy) where the cheese originates is 100 hectares of pasture land in Auvergne, at an altitude of just under 1km, with alpine flowers and wild blueberries. The Mondbeliardes breed cows graze on these, and the result is a range of mostly AOP certified cheeses: Bleu d'Auvergne, Fourme d'Ambert, Salers, Cantal, Saint-Nectaire. This cheese, the Fourmette de la Croix de Chazelles, is a newer uncooked and unpressed cheese of their own creation and, therefore, not certified AOP. But that doesn't make it any less delicious. It turns out blueberries make for a very nice blue cheese. In fact, it's a sweet, creamy, tangy blue that's not bland but not terribly strong, either. It's got hints of hazelnut coming through in the large expanses of non-veined cheese. La Fourmette de la Croix de Chazelles is aged 4-10 weeks, during which time the younger brother on the farm is responsible for injecting in the blue molds and encouraging the blue streaks during the affinage process. At first, I choose this cheese because the word "croix" in the name ("cross") reminds me of the pin that Gigi receives when skiing and snowboarding in the Alps on their school "field trips". Also, I like how "fourmette" is in the name of the cheese, to accompany a story about "formations" -- where you learn new skills and reach a new, officially-named, level. But as I research the cheese, I find there's an even better connection between the Fourmette de la Croix de Chazelles and a story about formations and certifications: In order to master the techniques of crafting blue-veined cheeses, one of the Vergnol brothers who co-owns the farm went for a formation himself and has the certificate to show for it. I read that he went to ENIL at to Aurillac, but in fact, he either went to ENILV (the Ecole National des Industries du Lait et des Viandes) in Aurillac, or ENIL (Ecoles Nationales d'Insutrie Laitiere) between Besancon and Mamirolle, or to the organic version at Poligny. I suspect he went to ENIL at Besancon-Mamirolle, but either way, he went for specialized training and got not only know-how but also something to put on his resume -- an official cheese-making level. At ENIL, one can earn diplomas and certificates in Second Pro, Bac Pro, Bac+2, Professional Cheese License, and Master Pro Dairy Worker, in both one-day stages and classes as well as professional two-year formations. And finally, this next photo has nothing to do with France (since it took place in Turkey), but everything to do with certificates. I just really like that the one of our fellow hot-air-ballooners received this certificate with her name proudly printed on it: "Ah Chew". This cheese looks absolutely delicious !